The ultimate special effects movie has blasted its way onto DVD and to quote the original cartoon series which this movie is based on, there's more than meets the eye with the live action version of the Transformers. Although loosely based on the original cartoon series, the Transformers, this current incarnation has taken some artist license to create a unique and different twist on the franchise that became a blockbuster hit. The story revolves around two clans of robotic aliens, the Autobots and the Decepticons who have been battling for centuries and unfortunately for Earth, this is their next battle ground. When Sam Witwicky (Shia LaBeouf) is given a beat-up car by his father, he soon learns that this automobile is not your average car and strange things start to occur. Witwicky is also your average guy in school and when he attempts to woo his classmate Mikaela (Megan Fox), he falls flat on his face until they are both drawn into the war between the Autobots and Decepticons that forces Sam Witwicky to become the hero he was destined to be. The story of Transformers is quite clichéd and forced in some bits that seems like there are a variety of stories going on at once but fortunately, these stories are loosely tied before the end but the real stars of the movies are the spectacular effects which makes this movie one of the most realistic science fiction tales. Although originally seeing this movie in the cinemas and then on DVD, I am still dumbfounded at how realistic these robots are, especially when they turn from cars into Mech looking robots that interact perfectly with the real-world environment. In the end, Transformers is a movie that everyone can enjoy and before you start to pick on the story, it's better to just sit back, relax and appreciate the cinematic computer generated special effects and for those fans of the original series, there will be mixed reviews but this is a dream come true for most. 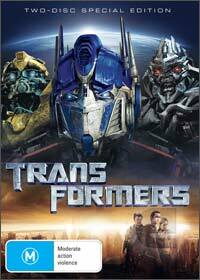 The video and audio quality of the Transformers is spectacular and match that with a variety of great special features and this DVD is definitely a must have title for your collection. Brilliant!